The Bullmastiff was bred in England by crossing the English Mastiff with the Bulldog. Such crosses were mentioned in documents as far back as the 1700’s, but the modern Bullmastiff likely derives from later crosses in the late 1800’s. Wealthy estate owners bred the dog to chase down and fight off game poachers, taking speed from the Bulldog stock and strength from the Mastiff. The targeted mix was sixty percent Mastiff and forty percent Old English Bulldog. The Bullmastiff was originally bred with a dark coat to serve as natural night camouflage (then called the ‘Gamekeeper’s Night Dog’), but fashionable light coating was later preferred when the breed began serving as estate dogs for the upper class. 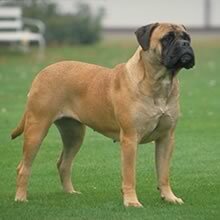 The Bullmastiff was recognized by the American Kennel Club in 1933. Famous Bullmastiffs include Rocky’s dog ‘Butkus’ and the title character from the film ‘See Spot Run’. The Bullmastiff has a short-haired red, light tan (‘fawn’) or reddish-brown (‘brindle’) coat with a distinctive dark area on the muzzle and ears and around the eyes. Some white on the chest is permissible. Bullmastiffs shed little. The Bullmastiff is intelligent, loyal, obedient, and courageous. It builds a strong bond of devotion with its family. Bullmastiffs are highly protective of their family against any perceived threats, but they are much more likely to bowl over strangers than attack, which makes them desirable as guard dogs. They do, however, have a stubborn side which sometimes makes them resistant to obedience training. Some Bullmastiffs may drool or snore. The Bullmastiff is intelligent, loyal, obedient, and courageous. It builds a strong bond of devotion with its family. Bullmastiffs are highly protective of their family against any perceived threats, but they are much more likely to bowl over strangers than attack, which makes them desirable as guard dogs. They do, however, have a stubborn side which sometimes makes them resistant to obedience training. Some Bullmastiffs may drool or snore. The Bullmastiff can be somewhat dominant toward other Bullmastiffs (males especially do not get along), but is very tolerant towards children and can get along with other household pets provided proper socialization has taken place, preferably when young. Though they would do no harm intentionally, Bullmastiffs should be watched around young children due to their immense size. You can find Bull Mastiff puppies priced from $250 USD to $2500 USD with one of our credible breeders. Browse through our breeder's listings and find your perfect puppy at the perfect price. The Bullmastiff is sensitive to the tone of its master’s voice; its handler must demonstrate authority and consistency. Obedience training is recommended for the Bullmastiff, but their stubbornness may make the process difficult. Bull Mastiff Puppies for Sale - Shipped Worldwide! Finding the right Bull Mastiff puppy can be dog gone hard work. PuppyFind® provides a convenient and efficient means of selecting and purchasing the perfect Bull Mastiff puppy (or Bull Mastiff puppies) from the comfort of your home, 24 hours a day, 7 days a week. Take advantage of our PuppySearch or leisurely browse our directory of hundreds of dog breeds, Bull Mastiff dog breeders, Bull Mastiff dogs for adoption, and Bull Mastiff puppy for sale listings with photos and detailed descriptions. Some Bull Mastiff puppies for sale may be shipped Worldwide and include crate and veterinarian checkup. Many Bull Mastiff dog breeders with puppies for sale also offer a health guarantee. With thousands of Bull Mastiff puppies for sale and hundreds of Bull Mastiff dog breeders, you're sure to find the perfect Bull Mastiff puppy.